Please enter between 2 and 250 Users. View Pricing Chart Need more than 250? You can get more for your money. With our tiered pricing, you get larger discounts by buying more user licenses at once or purchasing a longer licensing period. This single solution is designed for businesses with limited IT resources so it’s easy to install and doesn’t require expertise to use. The latest Advanced edition keeps business information private by locking down USB drives and other storage devices. Also, it stops data loss through email, blocks spam both before and on the Exchange Server, and secures both Macs and PCs. 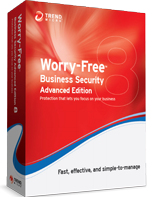 Worry-Free™ Business Security solutions provides businesses with fast, effective, and simple protection that allows for uninterrupted and optimal use of their computers and servers. It provides effective protection that stops web threats before they reach your business machines while minimizing any slowdowns. The newest version of Worry-Free Business Security now controls access to USB drives and other attached devices to prevent data loss and block threats. In addition to PC security, WFBS Advanced has integrated protection for Mac clients (iMacs and MacBooks) and servers, without needing to purchase and manage additional solutions. The latest Worry-Free Business Security solutions provide customized installation options, so you only get the security you need. With continuous updates—most of which are stored on the local security server instead of your business computers – new threats are blocked faster, which reduces the impact on your computers’ performance. Copyright (c) 1989- 2019 Trend Micro, Incorporated. All rights reserved. | This site is hosted for Trend Micro by Digital River Inc.